The Guild F-40 Traditional embodies the features that make jumbo-sized acoustics some of Guild’s most beloved and revered models. 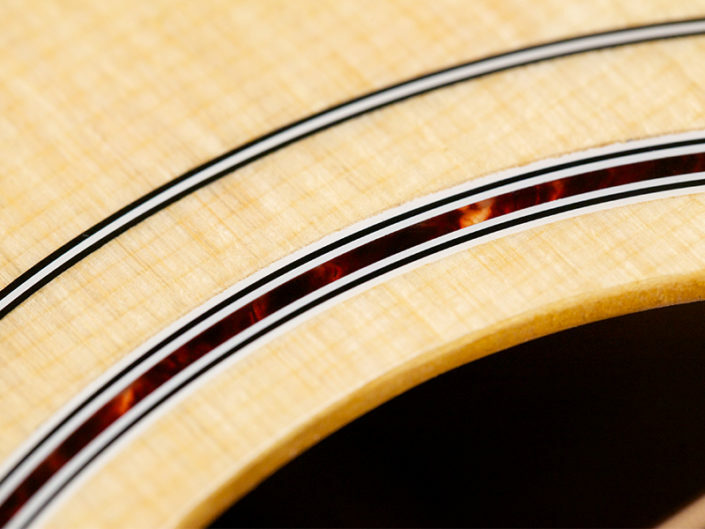 Using a high-grade solid Sitka spruce top and solid African mahogany back and sides, Guild adds scalloped Adirondack braces for power, nuance and responsiveness. The F-40 Traditional’s three piece mahogany and walnut neck is topped with an Indian rosewood fingerboard and is joined to the body with an authentic dovetail joint. This classic jumbo is handsomely appointed with a tortoiseshell pickguard, rosette, and binding, a genuine mother-of-pearl Guild peak and chesterfield logo inlaid on the headstock, and nickel-plated open gear tuners. A lustrous nitrocellulose lacquer provides an elegant finish to this masterpiece, optimizing the beauty and resonant qualities of its premium woods. Each F-40 Traditional includes a hand-signed, numbered certificate of authenticity, and ships with a Guild humidified hardshell case. Available in Natural or with an Antique Sunburst top. Proudly made in the USA. Guild is excited to ring in a new era of USA production. Interpreting classic Guild designs through an innovative approach and modern technology, these guitars feel and sound better than ever and are Made to be Played.